El Greco is one of the most important artists in the Renaissance period, bridging the gap between Byzantine and Venetian art, between the religious and the secular, and influencing modern art from Picasso to Ireland’s own Patrick Pye, and influencing modern composers and movie makers. His influence in Ireland includes Patrick Pye, and his works include ‘Saint Francis’ in the National Gallery in Dublin. El Greco, or Domenikos Theotokopoulos, brought together Byzantine and Venetian schools of art, and is part of the introduction of Byzantine thought to the west that played a crucial role in the germination of the Reformation and Renaissance in western Europe. But I need to begin with some disclaimers and some explanations. I am not an art historian. I have taught Church History at post-graduate level, my interests in El Greco grow out of my interest in the role of iconography in Orthodox theology, my regular visits over the past 30 years or more to Crete, where it is not possible to be culturally aware without being conscious too of the influence and legacy of El Greco, and from my friendship over many years with the late Patrick Pye. I have lectured widely on iconography, including lecturing on the Sinaitic School of Iconography in Crete, I have reviewed icon exhibitions for Greek newspapers, and I have taught Byzantine studies for the Maynooth extension campus in Kilkenny, and, of course, I have visited many of the museums and galleries that are important to this evening’s topic. The rejuvenated Museum of Christian Art in the Church of Saint Catherine of Sinai in Iraklion, the capital of Crete, is a hidden gem, found in a quiet square in the side streets of the city, nestling beneath the shadows of Saint Minas Cathedral. Iraklion was known to the Venetians as Candia, and was one of the last outposts of the Venetian Empire in the East Mediterranean. Initially, artistic developments in Crete were interrupted with the Venetian conquest of 1211, and for some decades the island was isolated from the artistic centres of the Βyzantine Empire. After a century of bloody uprisings, a treaty between Venice and the Cretan rebels led by Alexios Kallergis in 1299 guaranteed the religious freedom of the Orthodox people on the island. Although Venice persisted in trying to force a union of the Orthodox and Catholic Churches, these freedoms and guarantees allowed a new development in fresco painting and icon writing in Crete. When Candia or Iraklion fell to the Ottoman Turks in 1669, the academy at Saint Catherine’s came to an end, and like many churches in Crete it became a mosque. When Crete was united with the modern Greek state in 1913, Saint Catherine’s was abandoned for some years, was used to shelter refugees from Anatolia, and during World War Ii it was used by the Nazis as a depot. It later became a church once again, and then housed an inadequate museum that closed in 2007. The new museum opened three years ago (2015) and this unique museum is a testament to the Orthodox heritage of Crete, and home to some of the most important works of art created in Crete. Careful scholarship has provided critical and contextual explanations, supported by interactive, audio-visual and multimedia presentations. Doménikos Theotokópoulos or ‘El Greco’ (1541-1614) is closely identified with the Spanish Renaissance. Yet, as his popular nickname indicates, he was Greek by birth and he normally signed his works with his full birth name in Greek letters, Δομήνικος Θεοτοκόπουλος (Doménikos Theotokópoulos). Theotokópoulos was born in Venetian Crete in 1541, the descendant of a prosperous urban family that had probably been driven out of Chania in western Crete to Iraklion after an uprising against the Venetians in 1526-1528. His father, Geórgios Theotokópoulos (died 1556), was a merchant and tax collector. Most authorities say he was born in Iraklion, but many people in Crete continue to claim he was born in the village of Fodele, west of Iraklion, where villagers point to the ruins of his family home. Some Catholic sources have claimed El Greco from birth, but modern Greek scholars, including Nikolaos Panayotakis, Pandelis Prevelakis and Maria Constantoudaki, have shown that the Theotokópoulos ‘family was almost certainly Greek Orthodox.’ One of his uncles was an Orthodox priest, and his name is not mentioned in the Roman Catholic baptismal archives in Crete. El Greco received his initial training as an icon-writer at the Cretan School in Saint Catherine’s in Iraklion. In addition, he probably studied the Greek classics. In 1563, at the age of 22, he was described in a document as a ‘master’ (maestro Domenigo), meaning he was already a master of the guild and presumably operating his own workshop. Three years later, in June 1566, as a witness to a contract, he signed his name as μαΐστρος Μένεγος Θεοτοκόπουλος σγουράφος (Master Menégos Theotokópoulos, painter – Menegos is the Venetian dialect form of Doménicos, while Sgourafos (σγουράφος = ζωγράφος) is a Greek term for painter). Archival research in Crete shows that at the age of 26 he was still working in Iraklion, where his work in the post-Byzantine style was highly esteemed. On 26 December 1566, the Venetian authorities gave him permission to sell a ‘panel of the Passion of Christ executed on a gold background.’ That Byzantine-style icon was sold a day later in Iraklion for 70 gold ducats. The two artists who valued the work included the Cretan icon-writer Georgios Klontzas. At the time, 70 ducats was the going price for a work by Titian or Tintoretto. Soon after, probably early in 1567 at the age of 26, El Greco moved to Venice, like other great Cretan masters before him. But, unlike other Cretan artists in Venice, El Greco substantially altered his style and sought to distinguish himself by inventing new and unusual interpretations of traditional religious subject matter. He was influenced by the Venetian Renaissance style of the period, with agile, elongated figures reminiscent of Tintoretto and a chromatic framework that connects him to Titian. According to the Croatian miniaturist Giulio Clovio, El Greco in Venice was a ‘disciple’ of Titian, who was then in his 80s but still active. The Venetian painters also taught him to organise his multi-figured compositions in landscapes vibrant with atmospheric light, and during his stay in Italy he enriched his style with elements of Mannerism and of the Venetian Renaissance. In 1570, he moved to Rome, where his works were strongly marked by his Venetian experiences. By then, Michelangelo and Raphael were dead, and El Greco was determined to make his own mark in Rome. Later, when asked what he thought about Michelangelo, he replied that ‘he was a good man, but he did not know how to paint.’ When Pope Pius V asked him to consider painting over parts of the Sistine Chapel, he is supposed to have claimed that he could do just as well as Michelangelo while also observing the proprieties. In Rome, he came into contact with the intellectual elite of the city, including Fulvio Orsini, whose collection would later include seven paintings by El Greco, including his View of Mount Sinai and a portrait of Clovio. 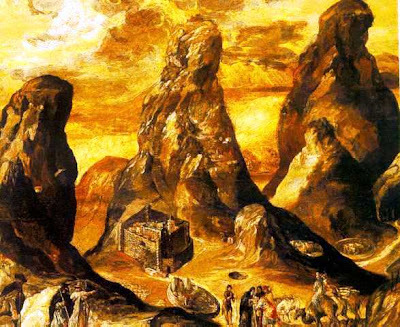 El Greco’s View of Mount Sinai dating from around 1570, is his only work in the Historical Museum in Iraklion, yet it is such an obvious theme for someone from Saint Catherine’s. The painting, in oils on tempera-primed wood, shows an imaginary view of Mount Sinai, with Saint Catherine’s Monastery and a group of pilgrims in the foreground. The misshapen, stylised mountains give a foretaste of his later, elongated style, but are a familiar way of depicting mountains in Byzantine iconography. The Byzantine use of space in that work is found forty years later in his View of Toledo, the first true romantic landscape in the history of art. By then, El Greco had made enemies in Rome. He may have returned to Venice ca 1575-1576, but in 1577 he moved to Spain, first to Madrid, and then to Toledo, the religious capital of Spain. He signed contracts for a group of paintings for the church of Santo Domingo el Antiguo in Toledo and by September 1579 he had completed nine paintings for the church, including his first work in Toledo, The Assumption of the Virgin (1577-1579), with his signature in Greek, and The Trinity, now in The Prado in Madrid. Subsequent works, including the Allegory of the Holy League or the Adoration of the Holy Name of Jesus and The Martyrdom of Saint Maurice, violated a basic rule of the Counter-Reformation that in an image the content was paramount rather than the style. Because of this, any hopes he held for royal patronage came to an end and El Greco was obliged to remain in Toledo. In 1586, he received the commission for The Burial of the Count of Orgaz, his best-known work. The discovery in 1983 on Syros of The Dormition of the Virgin and its identification as an early work by El Greco places this great masterpiece within the Byzantine tradition of iconography. Christ, clad in white and in glory, is the crowning point of the triangle formed by the figures of the Virgin Mary and Saint John the Baptist in the traditional Orthodox composition of the Deesis. The soul of the dead man is being transported to Heaven in the form of an ethereal infant in accord with Orthodox tradition. 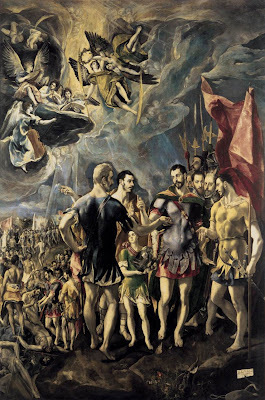 From 1597 to 1613, El Greco was working intensely on several major commissions, including three altar pieces for the Chapel of San José in Toledo (1597-1599); three paintings for the Colegio de Doña María de Aragon in Madrid (1596–1600); the painting Saint Ildefonso for the Capilla Mayor of the Hospital de la Caridad (Hospital of Charity) at Illescas (1603-1605); and The Virgin of the Immaculate Conception (1607-1613). El Greco lived in considerable style in Toledo, but did he live with his Spanish companion, Jerónima de Las Cuevas? We do not know. They probably never married, although she was the mother of his only son, Jorge Manuel, born in 1578, who also became a painter. 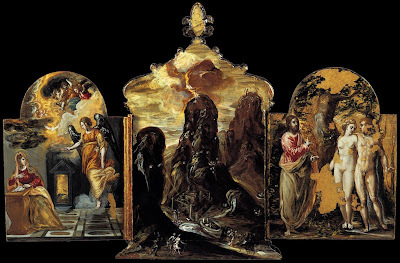 Domenikos Theotokopoulos, El Greco, bridges the gap between East and West, between the Renaissance and Byzantine worlds. This painting, which shows Saint Francis of Assisi receiving the stigmata, dates from ca 1590-1595. It is in oil on canvas, measures 114 x 104 cm, and was presented to the National Gallery in 1914 by Sir Hugh Lane. Saint Francis of Assisi is said to have experienced a mystical vision at Mount Alvernia in 1224, during which he received the Stigmata, or wounds of the crucified Christ. This is one of a number of paintings by El Greco of the life of Saint Francis. Here we see Saint Francis looking heavenwards, as stormy clouds frame his body and seem to reflect his inner state. The marks of the stigmata are visible on his right palm. The skull acts as a physical reminder of human mortality. Since the beginning of the 20th century, scholars have debated whether his style had Byzantine origins. Some art historians assert that his roots were firmly in the Byzantine tradition, and that his most individual characteristics derive directly from the art of his ancestors. 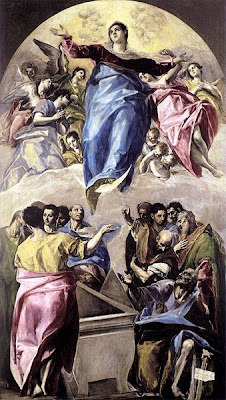 The Byzantine influence from his training under Damaskinos at Saint Catherine’s, Iraklion, remained an important factor in El Greco’s work throughout his life. His pictures are theological in character rather than religious. He makes a clear distinction between the divine world and the material world, which he shows as separate yet mutually accessible realms. The primacy of imagination and intuition over the subjective character of creation was a fundamental principle of El Greco’s style. He discarded classicist criteria such as measure and proportion. He believed that grace is the supreme quest of art, but that the painter achieves grace only if he manages to solve the most complex problems with obvious ease. For him, colour was the most important and the most ungovernable element of painting, and he declared that colour had primacy over form. We have seen how his preference for exceptionally tall and slender figures and elongated compositions found early expression in his View of Mount Sinai . In these elongated figures, he was marrying Byzantine traditions with those of Western painting. This preference served both his expressive purposes and aesthetic principles, and led him to disregard the laws of nature and to elongate his compositions to ever greater extents, particularly when they were commissioned for altarpieces, so that the human anatomy becomes even more other-worldly in his mature works. 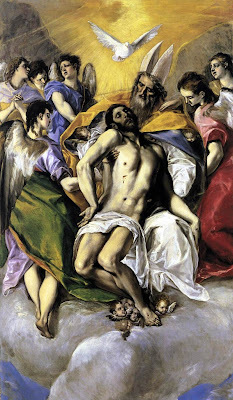 The English art historian David Davies finds the roots of El Greco’s style in the intellectual sources of his Greek Orthodox education and in his memories of the liturgical and ceremonial life of the Orthodox Church. Davies believes that the religious climate of the Counter-Reformation and the aesthetics of mannerism acted as catalysts to activate his individual technique. Davies asserts that the philosophies of Platonism and Neo-Platonism, the works of Plotinus and Pseudo-Dionysius the Areopagite, the Patristic texts or writings of the Early Church Fathers and the Orthodox Liturgy offer the keys to understanding El Greco’s style. The discovery in 1983 on Syros of the Dormition of the Virgin in the church of that name – an authentic, signed icon from the painter’s Cretan period – and earlier, extensive archival research in the early 1960s, have helped to reposition El Greco within the Byzantine and post-Byzantine traditions of icon-writing in Crete. 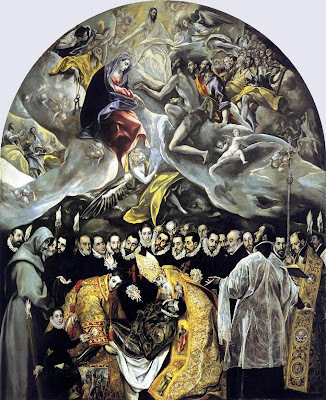 This work, which provided the model or type for El Greco’s best-known masterpiece, the Burial of the Count of Orgaz (1586-1588), ‘employed Palaiologian stylistic methods’ and follows many of the conventions of Byzantine icon-writing. Where we can detect Venetian influences, they are shared by El Greco with his Cretan contemporaries from the Sinaitic tradition. 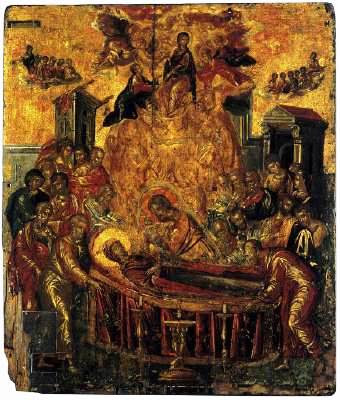 The composition of the Dormition, showing the death of Mary, skilfully balances the differences between the Orthodox doctrine of the Dormition of Mary and the Roman Catholic doctrine of her Assumption, sensitively balancing contemporary denominational affiliations in Venetian-ruled Iraklion. The discovery of the Dormition has since led to the attribution of three other signed works of ‘Doménicos’ to El Greco – the Modena Triptych, which may have been painted before he left Crete and with a centrepiece also depicting Mount Sinai; Saint Luke Painting the Virgin and Child (the Benaki Museum, Athens) and The Adoration of the Magi. El Greco’s contemporaries found him incomprehensible and, apart from his son, he had no important followers. His dramatic and expressionistic style was met with puzzlement by his contemporaries. But there was a revival of interest in his work in the late 19th century, and we can now see him as the precursor of the European Romantic movement. In the 1890s, Spanish painters living in Paris adopted him as their guide and mentor, and he found a new appreciation in the 20th century so that he is also regarded as a precursor of both Expressionism and Cubism. El Greco’s work influenced modern painters including Édouard Manet, Paul Cézanne, Picasso and the early Cubists, as well as 20th century Expressionist movements in Europe and America. The symbolists and Pablo Picasso during his Blue Period drew on the cold tonality of El Greco, utilising the anatomy of his ascetic figures. While Picasso was working on Les Demoiselles d’Avignon he visited his friend Ignacio Zulogia in his studio in Paris, where he studied El Greco’s The Opening of the Fifth Seal, which Zuloaga had owned since 1897. 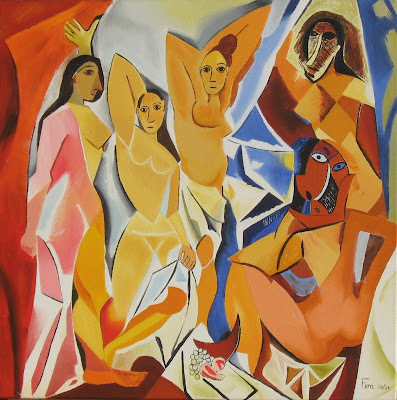 Foundoulaki asserts that Picasso ‘completed … the process for the activation of the painterly values of El Greco which had been started by Manet and carried on by Cézanne.’ El Greco’s influence has also been traced in the work of Franz Marc and of the abstract expressionist Jackson Pollock. 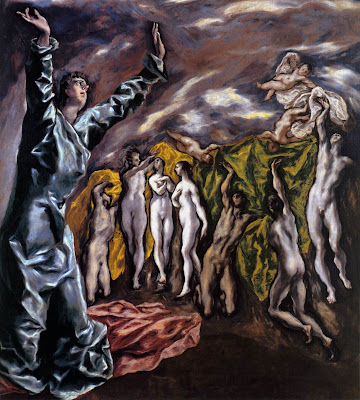 The Irish artist Patrick Pye also wrote of El Greco’s influence on modern art: ‘The rediscovery of El Greco did not come from Christians, but from the Romantics, the last people who tried to hold sense and sensibility together. Then he was discovered by the Post-impressionists, who were trying to create a new visual language. 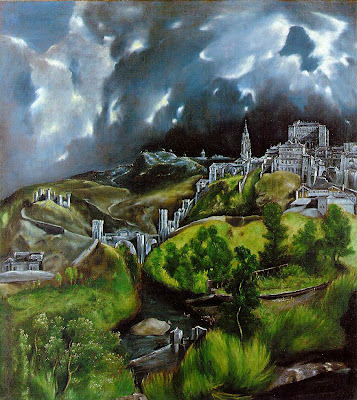 The 400th anniversary of the death of El Greco was marked five years ago (2014) with a series of major exhibitions in Toledo and Madrid, ‘The Greek of Toledo.’ They presented Crete’s greatest artist as a leading figure in the history of European art. He started painting in 1943 under the sculptor Oisín Kelly, and later studied at the National College of Art in Dublin. In 1957, he received a scholarship to attend the Jan Van Eyck Academy in the Netherlands, where he began working with stained glass under Albert Troost. 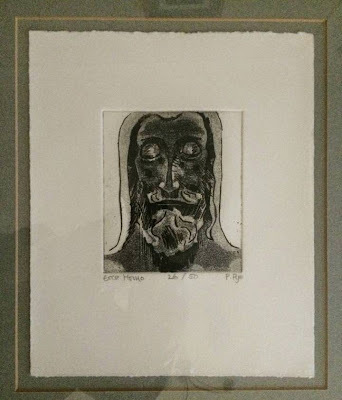 In 1973, he began etching at the Graphic Studio in Dublin, and he has had many solo exhibitions in Dublin. He has completed many major commissions on religious themes, including Glenstal Abbey, Co Limerick. The Royal Hibernian Academy exhibited ‘Triptychs and Icons,’ a retrospective of his work, in 1997. ‘The Transfiguration,’ a 10-ft wall-hanging for Saint Mary’s Oratory, NUI Maynooth (2000) predated his honour of a DPhil from Maynooth (2005). His large painting, ‘Theologian in his Garden,’ was acquired by Saint Thomas’s University, St Paul, Minnesota, for its Centre of Catholic Studies. Patrick Pye was also a man of deep personal faith, a devout Roman Catholic who sought to reinvigorate contemporary religious painting. 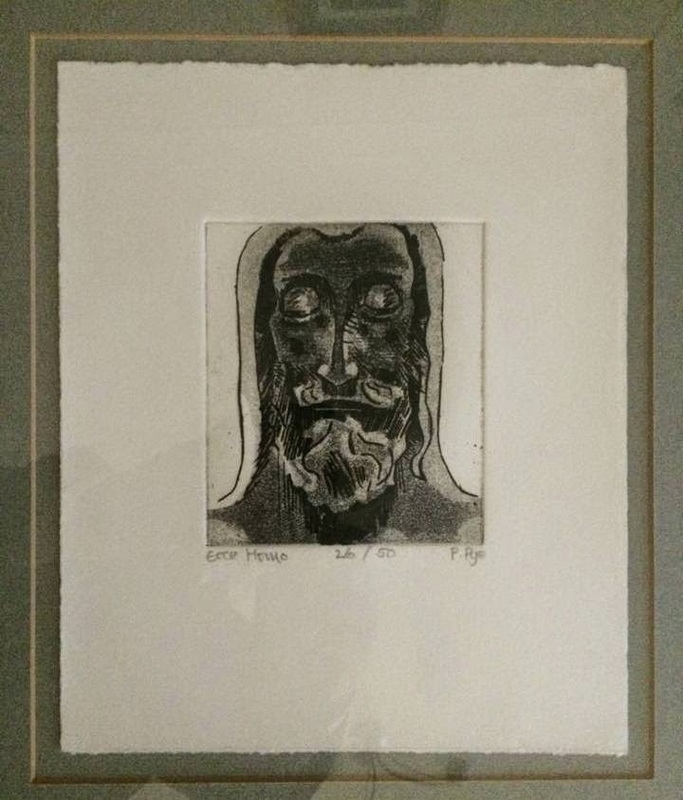 His influences included John Piper, who designed the East Window in the chapel of Saint John’s Hospital, Lichfield, ‘Christ in Majesty’ (1984), Graham Sutherland (including his tapestry in Coventry Cathedral), Stanley Spencer, Paul Nash, Paul Gauguin and, of course, El Greco. He was also one of the great living experts on El Greco. 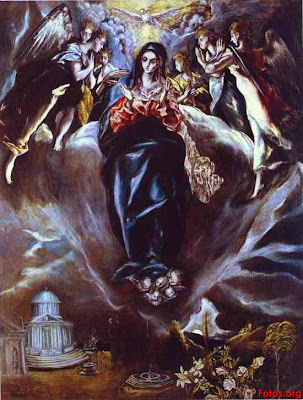 He particularly admired El Greco work for many years, and was deeply influenced by him. ● How do I represent a reality, a mystery that ultimately transcends all representation? ● How do I point to, evoke that reality effectively in paint? ● How have others so resolved it and how can I? To Greeks, El Greco remains the quintessential Greek artist. In Greece, he is loved not just by experts and art lovers but also by ordinary people. Led by the Greek composer Vangelis Papathanassiou, Greeks were passionate and spontaneous in a campaign that raised $1.2 million to buy El Greco’s Saint Peter for the National Art Gallery in Athens in 1995. The Greek writer Nikos Kazantzakis, who was born in Iraklion, felt a great spiritual affinity for El Greco, called his autobiography Report to Greco, and wrote a tribute to the artist. El Greco has also inspired Greek poets, including Odysseas Elytis (Diary of an Unseen April). The composer Vangelis was born Evangelos Odysseas Papathanassiou in 1943. When the colonels seized power he went into exile in Paris, and he moved to London in 1974. He is best known in the English-speaking world for his score for the movie Chariots of Fire, but his style of music is wide-ranging and diverse. He has worked on three projects about El Greco. His album Φόρος Τιμής Στον Γκρέκο (Foros Timis Ston Greco, Tribute to El Greco) was released in 1995, when I attended a concert by the composer in Athens. 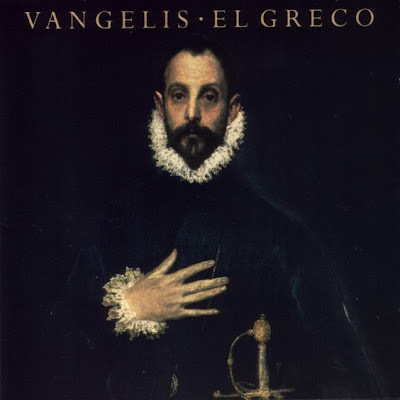 I still treasure my copy (415/3,000) of the album which was published in 1995 as a limited edition of 3,000 CD-audios by the National Art Gallery and Alexandros Soutzos Museum in Athens to raise funds to buy El Greco’s Saint Peter. Vangellis expanded this work with three more tracks on El Greco in 1998. This symphonic album inspired by the artist develops his earlier work, Φόρος τιμής στον Γκρέκο, A Tribute to El Greco (1995). In 2007, he composed the soundtrack for the movie El Greco (2007), released on CD as El Greco Original Motion Picture Soundtrack in Greece in 2007. El Greco’s life is also the subject of the movie El Greco (2007), filmed in Crete. It is based on the fictionalised biographical novel, El Greco Δομήνικος θεοτοκόπουλος Ο Ζωγράφος του θεού (El Greco: Domenikos Theotokopoulos o Zografos tou Theou, or El Greco: Domenikos Theotokopoulos, the Painter of God), by Dimitris Siatopoulos. It is directed by Yannis Smaragdis and written by Jackie Pavlenko. The main cast includes Greek actors Lakis Lazopoulos, Dimitra Matsouka, Dina Konsta, Sotiris Moustakas and Katerina Helmi, along with Juan Diego Botto, Laia Marull and others, with Nick Ashdon playing El Greco. To conclude: it is an irony of history that icon-writing survived on Mount Sinai through the violence of iconoclasm because of the protection provided to Saint Catherine’s Monastery by Egyptian Muslim rulers. That particular approach to icon-writing became dominant inVentian-ruled Crete. Through Theophanes, Damaskinos, and other members of the Cretan school and their influence, the tradition of icon writing on Mount Athos was transformed in the 16th, 17th and 18th centuries. And through Cretan icon-writers such as Damaskinos and El Greco, icon-writing burst into the artistic world in Renaissance Europe, and had an indelible influence on the ways in which form, shape and light were used in European painting ever since. El Greco is a pivot figure in the way the Cretan School of Icons bridges the gap between Byzantium and the West. (Revd Canon Professor) Patrick Comerford is priest-in-charge the Rathkeale and Kilnaughtin Group of Parishes, and lives in the Rectory, Askeaton, Co Limerick and a former professor in the Church of Ireland Theological Institute and Trinity College Dublin.